The Human Rights Act 2019 (Qld) establishes in domestic legislation the right of people deprived of liberty, that is people in custody or otherwise detained, to be treated with humanity, respect and the inherent dignity of the human person. This right enshrines a minimum standard of treatment for people in custody, explaining that a person’s rights should only be curtailed to the extent necessary for their confinement. This right applies to those detained for criminal purposes, as well as people in custody for mental health or immigration purposes. This concept will have different consequences at each stage of the criminal process, as is explored below. The Act specifically states that those detained without charge must be segregated from persons who have been convicted of offences, unless reasonably necessary. This applies to a person who has been arrested and detained for questioning about a serious offence, but has not been charged with any offence. Generally, police can only detain a person for 8 hours without charge, questioning them for up to 4 hours. It also states they must be treated in a way that is appropriate for a person who has not been charged nor convicted. This accords with one of the fundamental aspects of our criminal justice system, that a person is innocent until proven guilty, and as such should be treated this way. Held in ‘incommunicado’ detention’. This means denied any contact with the outside world such as family, friends, or lawyers in a situation where they can only communicate with guards or co-detainees. A case pertaining to the Human Rights Act 2004 (ACT) provisions regarding humane treatment in custody held this may even extend the right to work to prisoners where it would foster their rehabilitation and support their wellbeing. In this case it applied to allow a prisoner a position tutoring other prisoners. However, the court is reluctant to declare the right of prisoners to work generally, confining it to particular cases and jobs. When appearing in court at trial or sentence, offenders are deprived of their liberty. Another ACT case established the right extended to the court room, commenting on the rudeness with which a Magistrate had treated the offender in a previous hearing. The court stated that even where the offender had committed a serious offence of which they rightly disapprove, judicial officers are to act with courtesy and respect, particularly when a sentence of imprisonment is imposed. This is because the criminal justice system must at all times recognise a person’s inherent dignity as a human and treat them accordingly. This right impacts sentences relating to prisoners whose circumstances mean the conditions of prison will be particularly harsh on them, resulting in shorter custodial sentences. A common example is prisoners who are elderly. A Victorian case established that this principle also extends to people suffering a serious psychiatric illness, in circumstances where the custodial environment is likely to result in the continuation or deterioration of this condition. The rationale for this is to allow imprisonment of such a person would be to deny their humanity. Another Victorian case stated the fact that a prisoner is likely to serve their sentence in protective custody, and as such in more isolation than a prisoner normally would, is also a relevant sentencing factor if it can be demonstrated this would be more onerous on them than a sentence served in mainstream custody. The use of extendable batons and capsicum spray has been ruled as unlawful in Victoria as it violates this right. All persons facing the criminal justice system deserve to have their rights fully protected. This includes not only during the trial process but also during any period of imprisonment that may be imposed upon conviction and sentence. Human Rights Bill 2018 (Qld) Explanatory Notes, clause 30, page 24-25. Eastman v Chief Executive of the Department of Justice and Community Safety  ACTSC 4. Moh v Pine  ACTSC 27. R v Kent  VSC 375. R v Bangard (2005) 13 VR 146. Application for Bail for H L (No 2)  VSC 1. Dale v Director of Public Prosecutions VSCA 212; Certain Children by the Litigation Guardian Sister Marie Brigid Arthur v Minister for Families and Children  VSC 796. Certain Children v Minister for Families and Children (No 2)  VSC 251. After decades of campaigning, the Queensland Parliament passed the historic Human Rights Act on 27 February 2019, with Robertson O’Gorman Director Dan Rogers in attendance as pictured. The historic day called for celebration for many who, for years, had tirelessly lobbied Members of Parliament, writing submissions and holding advocacy events to raise the profile of the need for human right’s to be legislated in Queensland. The Human Rights Bill was introduced into Parliament on the 31st October 2018 by the Palaszczuk Government. The Attorney-General and Minister for Justice the Honourable Yvette D’Ath introduced the Bill, stating its purpose as recognising the equal and inalienable human rights of all persons, and changing the culture of the public sector to put Queenslander’s first. Despite all Members agreeing they support human rights as a concept, the Act was fiercely debated in Parliament, with opposition Members claiming it was unnecessary and undemocratic, undermining the Westminster System. A parliamentary committee, committed to reviewing the Bill, accepted 149 written submissions. 135 of those were in support of the Bill. Among the stakeholders, there was general consensus that the Act should be based on the Victorian Human Rights Act, as well as having additional social and economic rights. In line with these submissions, The Queensland Act is the broadest piece of human right’s legislation in Australia. At the conclusion of the assembly’s debate, The Honourable D’Ath acknowledged hundreds of submissions from individuals and organisations, including both Caxton Legal Centre for which Dan Rogers is the President of the Management Committee, and the Queensland Council for Civil Liberties for which Terry O’Gorman is the Vice President. These submissions informed the debate regarding the introduction and form of the Act, with its introduction marking a historic day in Queensland’s history. 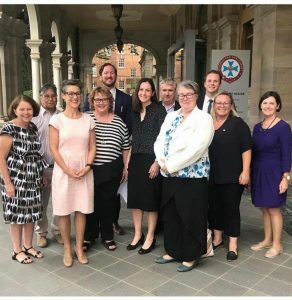 The Civil Liberties Council today called on both the Premier Annastacia Palaszczuk and Opposition Leader Deborah Frecklington to declare their public support concerning CCC Chair Alan MacSporran QC’s call for the Queensland Independent Remuneration Tribunal to take over setting staff entitlements for Queensland political parties. QCCL Vice-President Terry O’Gorman said that when the issue first broke, the QCCL said that the Premier should immediately review her decision to strip the KAP of three Parliamentary staff as it represented a breach of a major pillar of the 1989 Fitzgerald Report which mandated that non Government party members must be properly resourced to enable them to do their job. “The CCC Chair’s comments yesterday that the allocation of resources to elected members of Parliament is a fundamental plank in a democratic system and that there should not be political interference with Opposition parties’ resource allocation should be supported and acted upon immediately by both the Premier and the Opposition Leader”, Mr O’Gorman said. “Indeed, there is a necessity for the Premier today to immediately reverse her decision to strip KAP of its three Parliamentary staff and restore their staff entitlements”, Mr O’Gorman said. Mr O’Gorman said that any Parliamentary Committee set up to examine the fallout from the issue should also look at the Opposition’s role in the matter. “When the decision to strip KAP of its Parliamentary staffing was announced, Deputy Opposition Leader Tim Mander said the Opposition had shamed the Government into taking action to strip KAP of its Parliamentary staff”, Mr O’Gorman said. “If Mr Mander is calling for a Parliamentary Committee to examine the matter, the Opposition’s ‘behind the scenes’ role in the ultimate decision by the Premier to strip KAP of its Parliamentary staff must be examined and exposed”, Mr O’Gorman said.